She added that she would be happy to meet with the local community following the attack. THE MINISTER FOR Justice has spoken with the acting garda commissioner Noirín O’Sullivan about an attack last week in which a six-year-old was shot. 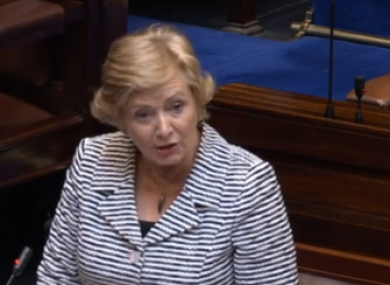 Frances Fitzgerald added that she ‘would be happy’ to meet with local residents affected by the shooting. “The interim garda commissioner assured me that progress is being made with all the necessary resources being made available,” Fitzgerald told the Dáil this evening. “An Garda Síochana is determined to bring those involved to justice,” she added, noting that the force have the “full support of the community”. The operation is being overseen by a senior investigating officer, Fitzgerald said. The minister was responding to a Topical Issue put forward by Sinn Féin TD Aengus Ó Snodaigh. He was not present in the chamber at the time with Labour TD Michael Conaghan, who also raised the topic yesterday, instead speaking on the issue. “People are silently seething that their communities act as a backdrop to these shootings,” he said, and noted that the local residents had carried out a lot of work to maintain the area and built it up from “nothing”. The minster said she would be happy to. I do believe it would be important to meet with the community. The minister said that gun crime “represents a real challenge for policing and poses significant potential for harm in the community”, and referenced a fall in both firearm offences and crimes involving a firearm by around 7% last year due to a “robust response” from gardaí. The 6-year-old child was shot in the neck in a house in Ballyfermot on Friday. Gardaí have said they believe the boy was not the intended target of the shooting. Email “Frances Fitzgerald and garda commissioner discuss shooting of six-year-old”. Feedback on “Frances Fitzgerald and garda commissioner discuss shooting of six-year-old”.